Despite evidence that natural resources play a major role in many conflicts – 40 percent of all civil wars since the end of the Cold War, according to an estimate by the UN Environment Program – a study conducted by Arthur G. Blundell and Emily E. Harwell for the NGO Forest Trends reveals that most ceasefire and peace agreements do not address natural resources. Blundell and Harwell refer to two peace agreement databases – the Transitional Justice Peace Agreements Database, from the University of Ulster, and the United Nations Peacemaker Database – to support their findings. Statistics from United Nations Peacemaker Database shows fewer than 15 percent of the more than 800 agreements signed since 1945 include the term “natural resources.” Among the 640 peace agreements recorded in the Transitional Justice Peace Agreements Database, none are coded for “refugees/land,” the closest term the database has to natural resources and the only term without any references. In addition, to examine implementation, the authors turn to a third database, the Peace Accords Matrix, run by the University of Notre Dame. Ten of 34 ceasefire agreements address natural resources in this database, but in seven cases, war either resumed or little to no effort was made to follow-through on commitments. If natural resources are not addressed post conflict, Blundell and Harwell point out, violence may be reignited, either directly funded by “control of the resources and their markets,” fueled by “grievances related to unsustainable and inequitable resources extraction,” or both. For the two large databases, Blundell and Harwell mark the proportion of agreements that address six major themes: vulnerable populations, development, governance, transitional justice, enforcement, and natural resources. The rates are different between the two – the Peacemaker database has more agreements that touch on transitional justice, vulnerable populations, and natural resources, for example – but similar trends in post-war settings are observed in both. Most peace agreements are not comprehensive, they conclude, often ignoring vulnerable populations and natural resources entirely, while giving more attention to governance and enforcement. The proportion of peace agreements addressing natural resources in a given year has actually decreased since the start of the Cold War. More worryingly, the effectiveness of past agreements, in places like Mindanao, Sierra Leone, and Nepal, has been poor. The innate fragility and complexity of peace agreements means that negotiators are often loath to bring up detailed natural resource issues, the authors say. Liberia in 2003 is an example. Though control of diamonds and timber clearly played a role in the civil war, provoking UN sanctions, natural resource management was only mentioned twice in the comprehensive peace agreement and only in reference to their control being given to the rebel group MODEL. Fortunately, the Security Council recognized the importance of these two resources and maintained sanctions until governance issues were addressed. The lack of detailed dialogue does not mean natural resources are absent in negotiations, write Blundell and Harwell. Resource management issues are mostly discussed in a “back channels” instead of formal agreements, which raises the possibility of conflict re-occurrence if local grievances are not addressed or exacerbated. The report proposes renewed emphasis on resource governance, an issue that has received attention, the authors note, but when push comes to shove is often jettisoned as either a distraction or too politically difficult – reasons which are not always internally consistent. Blundell and Harwell strongly suggest United Nations peacekeeping forces, in particular, re-examine how they are addressing natural resources in their operations. In addition, the authors recommend involving technical experts who have knowledge on particular resources more in negotiations in advising roles. Their input can help dispel confusion and facilitate better guidelines that are more likely to be followed. Blundell and Harwell also set their sights on high consumption countries. The interests of investors, international businesses, and indeed consumers in rich countries drive them to favor immediate exploitation of natural resources instead of moratoriums, which may be necessary to settle governance issues. This conflict of interest can lead to inattention to improving resource management or high political costs for doing so, as in the case of the Cardin-Lugar amendment to the U.S. Dodd-Frank act, which has attracted criticism for incurring economic costs. The lack of natural resource management in peace agreements is an important factor that contributes to conflict re-ignition, write the authors. Without increased attention to natural resource management from parties in conflict and peacekeepers, guidance from technical experts, and attention from consumer countries, progress in peacebuilding may be slow. Source: Forest Trends, Natural Resource Charter, UN Environment Program, U.S. Institute of Peace. 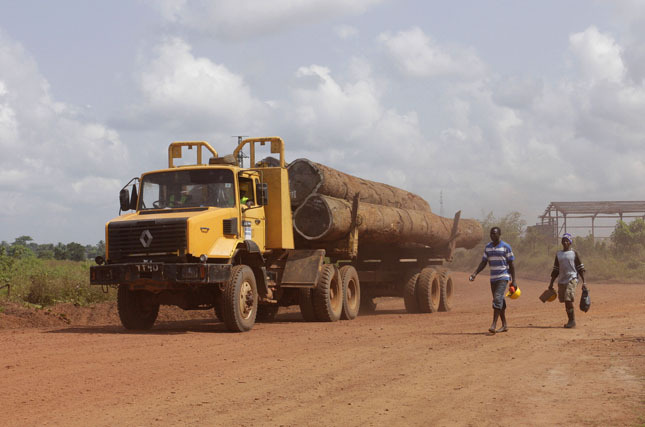 Photo Credit: Truck carrying timber toward Port Buchanan, Liberia, courtesy of Flore de Preneuf/Program on Forests.